I’m excited! I’m REALLY excited! 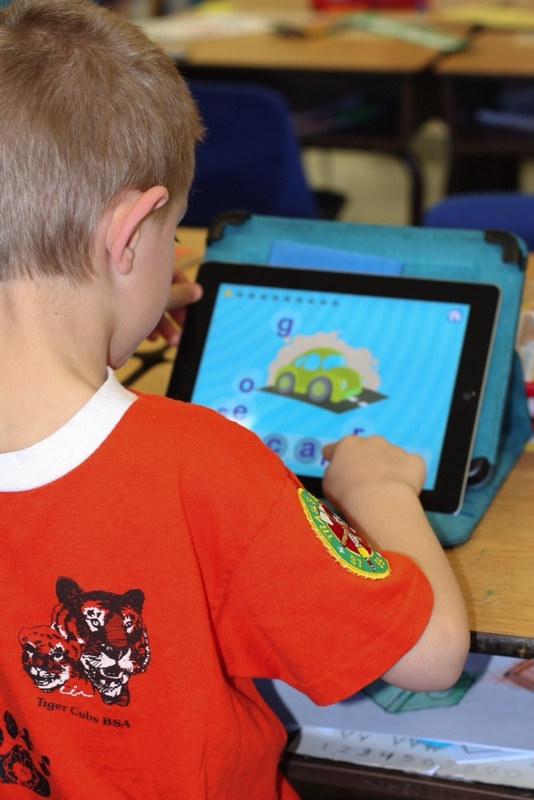 We (Auburn School Department) took a big risk last May when we started down the path to have the first 1to1 kindergarten learning with iPads initiative. We had confidence it would help us improve our literacy and math proficiency rates. One of our literacy specialists had used her own iPad with students to great success (one of the big reasons we moved forward). But there were also segments of the community that thought we were crazy. Now we have pretty good evidence it works! We did something not a lot of districts do: a randomized control trial. We randomly selected half our kindergarten classrooms to get iPads in September. The other half would use traditional methods until December, when they received their iPads. We used our regular kindergarten literacy screening tools (CPAA, Rigby, Observation Survey) for the pre-test and post-test. And across the board, the results were emerging positive for the iPad classrooms, with one area having statistical significance. And I’m especially excited that we went all the way to the Gold Standard for education research: randomized control trials. That’s the level of research that can open doors to funding and to policy support. Why do we think we got these results? We asked our kindergarten teachers that question. Anyone walking by one of the classrooms can certainly see that student engagement and motivation is up when using the iPads. But our kindergarten teachers teased it out further. Because they are engaged, students are practicing longer. They are getting immediate feedback, so they are practicing better. Because we correlate our apps to our curriculum, they are practicing the right stuff. Because we select apps that won’t let students do things just any way, we know the students are practicing the right way. Because they are engaged, teachers are more free to work one on one with the students who need extra support at that moment. We also believe we got the results we got because we have viewed this as an initiative with many moving parts that we are addressing systemically. A reporter asked me, how do you know how much of these results are the iPad, how much the professional development, and how much the apps. I responded that it is all those things together, on purpose. We are using a systemic approach that recognizes our success is dependent on, among other things, the technology, choosing apps wisely, training and supporting teachers in a breadth of literacy strategies (including applying the iPad), partnering with people and organizations that have expertise and resources they can share with us, and finding data where we can so we can focus on continuous improvement. And we’re moving forward – with our research, with getting better at math and literacy development in kindergarten, with figuring out how to move this to the first grade. Confirmation that our vision works. What do you think the implications of our research are? What do our findings mean to you? This entry was posted in Advantage2014 - Auburn iPads, Branding and Buzz, Learning as Desired Outcome, Technology for Learning and tagged Apps, Auburn, Branding and Buzz, ECE_iPads, Feedback and Evidence, iPad, Lead4Change Model, Tech Geek on February 16, 2012 by Mike Muir.